There is no spoon ! When I first saw that scene it struck a huge chord with me. At first Uri Geller popped into my head but then I started to think about the way the we are taught to see matter and energy. I remember being in a Physics lecture at college where the lecturer was telling that in reality, we do not have the ability to touch anything. It is only through a kind of repulsion do we get that feeling. 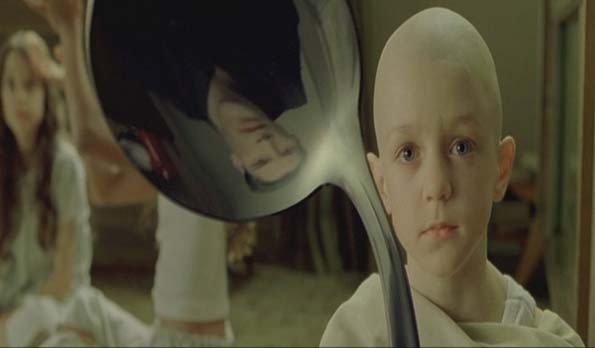 So in reality, you have never touched a spoon you have only been able to grasp it to the point where the repulsion on both sides provided enough pressure to levitate the spoon! We are in constant levitation, hovering just above the floor and the repulsion not allowing us to make contact with the ground. So in theory, we are constantly flying! What an absolutely incredible thought. Try telling a young child that and watch their reaction carefully…the innocence with which they will understand and believe much faster that adults. That spoon is energy bonded so tightly and has the vibration which forms what our brain interprets at the spoon. A tool, a solid object used to put food into the human body. We habitually forget the beauty of nature and once in a while I love taking a step back to adore her beauty. I work with computers and sometimes I forget the magic that they constantly are perfoming in front of us! a small electrical signal passes down loads of wires and transistors and and then as if by magic I can see my loved ones over a webcam! Please don’t take the small things around you for granted. Stop and have a look around once in a while, observe the immense beauty of what goes on around you! :: I discovered this wonderful and thoughtful post (slightly edited) in a blog, The Power of Choice that I would highly recomment. Thanks amit for allowing me to share it here. Keep up the wonderful work of spreading higher consciousness to the world. Behold! Surely the Universe communicate through your heart and mind. The heart of the conscious soul is the medium of communication of the Divine. Technology of the Heart: There is no spoon !